Installs under the rear seat. Structures, ie JL 8w7, Sundowns, Skars etc. For others, please provide specs during checkout. Terminals: Heavy Duty Spring Type. Now there is a solution for those wanting to get HUGE bass in their trucks. We are offering a new line of boxes that can fit those larger deeper 8" subs that won&#39t fit in other boxes. We are talking about JL Audio 8W7s and Sundown SA 8s and More. By lifting the seat 2.5" with a custom lift kit from LMI welding, this opens up the under seat area and allows the proper space needed for these types of subs. 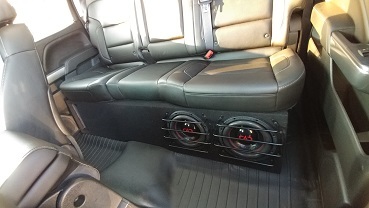 This box comes in a dual slot-ported configuration that will absolutely rock in your truck. Besides being larger than ordinary boxes, our lift kit boxes are built like army tanks. They are built completely from 3/4" MDF and are glued and screwed together, Internally braced and come with high end push style speaker terminals. Thats what it takes to contain these massive subs and Subthump knows how to deliver.